Anthony Joshua and The American dream. Then What? THE Coming to America memes have been in full flow since it was finally announced that Anthony Joshua is set to make his stateside debut. He meets Jarrell Miller in Madison Square Garden; Manhattan’s boxing mecca on June 1 and to say it has been met with disdain in the United Kingdom is something of an understatement. Social media post after social media post has been ransacked by fuming British fight fans. They hoped that somehow Joshua would be able to get in with either WBC ruler Deontay Wilder or ‘lineal’ champion Tyson Fury although that always seemed unlikely given how they appeared to be on a collision course after their first fight in December. That left the pickings slim of who the freight paying boxing consigliere would have accepted. British fight fans would have taken Dillian Whyte after his terrific 2018, which saw him scalp Lucas Browne, Joseph Parker and Derek Chisora while notching two fight of the year contenders and a pair of knockout of the year contenders. Outside of those it is hard to see an opponent who would have gained universal approval. Perhaps you would make a case of Oleksander Usyk, though he needs to dip his toes into heavyweight waters and surely even his ballsy brain trust would like to build into the division. With IBF, WBA and WBO bigwigs to satisfy, we could have wound up with Joshua-Tom Schwarz (WBO No. 3), Joshua-Agit Kabayel (IBF No, 3), Joshua-Trevor Bryan (WBA No.1) or Joshua-Manuel Charr for a WBA unification of sorts! Of course, Charr must overcome Fres Oqunedo first, but that’s a column for another time. Former AJ victim Alexander Povetkin seems to be the likely dance partner for Usyk, Chisora has been linked to Parker, Luis Ortiz is down to fight Christian Hammer and the WBC wants Whyte to face Dominic Breazeale. As Achilles screamed in Troy, “Is there no one else?” Well, not really. So the plot twists and then changes. Rather than having Joshua attempting to clean up or clear out the division, Plan B sees him taking on not so much Miller but the American market. This is a profile-building gig against a man who will do his share to enhance Joshua’s status with his fast mouth. ‘English muffin,’ as Miller called him, against American muffin top. But as vibrant as the heavyweight division is at the very top and as lively as several upcoming prospects might be, the depth is simply not there. And what happens to the division if the fight we thought was so easy to make, Fury-Wilder, does not happen? All of the eggs are in that basket, but say they took interim fights and agreed to rematch later this year they would have done an expert job of freezing Anthony Joshua, who holds three of the four belts – to repeat – out of his own division. And even if that contest happens, there is no guarantee that there will not be a trilogy fight. Then what does Joshua try to do? Consolidate his UK stance? Build in America? Who would he fight if he is left looking for another opponent he couldn’t get this time around? For a team that holds so many cards, they do not have anything like the stranglehold of the division they would like, even after entering into a co-promotional agreement with the Sauerland’s over Croat Filip Hrgovic. But, of course, it not all doom and gloom. The announcement that the Joshua-Miller pre-sale has done record numbers, though how many of those have already found their way onto the secondary market is unknown. And let us not forget two very important things about Joshua. Number one is he can fight. Number two is his charm offensive is second to none. America is likely to swoon with his every jackhammer punch on June 1 and while some big UK names have attempted to crack the US market this is the biggest and most celebrated UK assault on New York since Naseem Hamed took his bite out of the Big Apple and Flushing’s Kevin Kelley nearly rammed the core back down his throat in a multi-knockdown thriller that ended with the Sheffield superstar winning over four berserk rounds. The media glad-handing, which will undoubtedly spread him thin and leave him exhausted before and after the event, will surely go down a storm. He has a manner that will have the mainstream eating out of his hand and a promoter who could sell sand in the dessert. 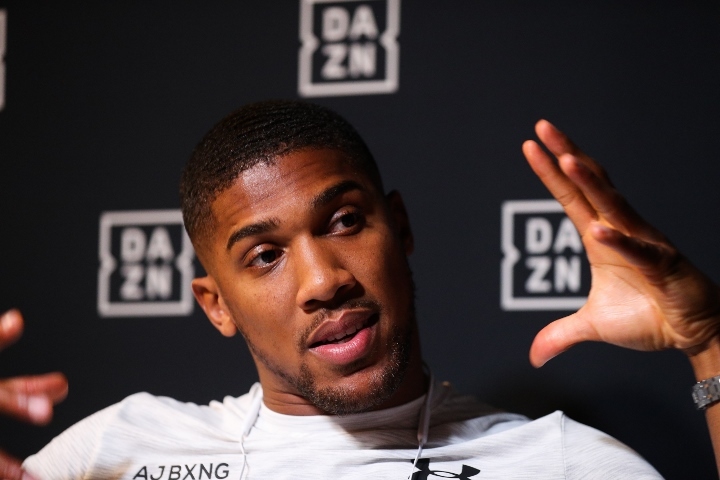 While public opinion of Joshua may not be as high in the UK as it once was, and it was astronomically elevated, his name maintains massive relevance and a high currency – and not just in boxing. That is a hard place to get to. It is hard to think of a British fighter who has ever had more endorsements in the UK, or with worldwide companies and retailers. Come to think of it, it is hard to think of any fighter at all. The Joshua juggernaut is likely to run wild over New York City and through Miller – pocketing an estimated $30million in the process – but then we are back to where we are now. If not Wilder and Fury – and maybe not even Whyte – then who, and for what reason? If he is allowed to ‘satisfy’ his mandatories to keep the titles then he will not be able to satisfy the fans for long. Miller serves a purpose – Joshua’s docking point in the USA – but a big fight needs to come out of somewhere or else his career as an attraction will be at risk of running aground, a liner simply too big for any harbour he calls into port at left travelling the ocean.